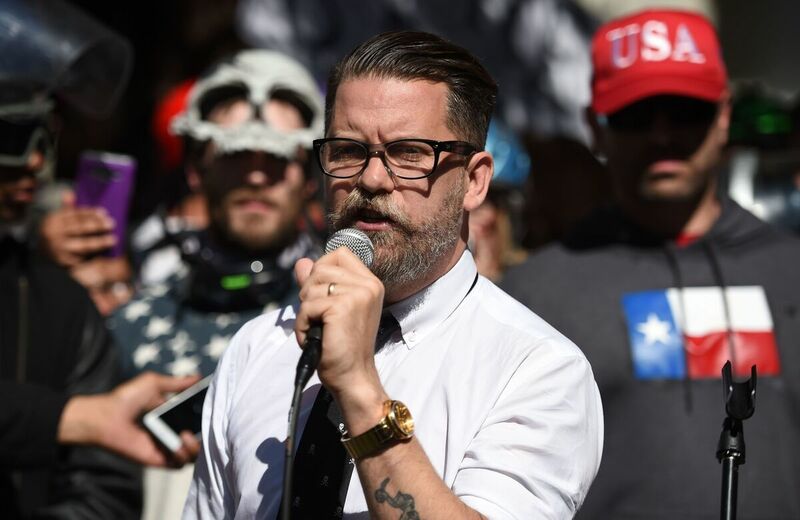 Proud Boys Founder Files Defamation Lawsuit Against Southern Poverty Law Center SPLC has labeled the far-right Proud Boys a hate group. Gavin McInnes denies that and says the designation has ruined his reputation and caused him and the group to be barred from online platforms. Conservative speaker and Vice Media co-founder Gavin McInnes reads a speech written by conservative commentator Ann Coulter to a crowd during a rally in Berkeley, Calif., in 2017. McInnes is perhaps best known as a co-founder of Vice Media, a position he left in 2008. He founded the Proud Boys group in 2016, describing it as a "men's club that meets about once a month to drink beer." The SPLC has said the reality is more complicated. "McInnes plays a duplicitous rhetorical game: rejecting white nationalism and, in particular, the term 'alt-right' while espousing some of its central tenets," the center states. Additionally, it states, "rank-and-file Proud Boys and leaders regularly spout white nationalist memes and maintain affiliations with known extremists. They are known for anti-Muslim and misogynistic rhetoric. Proud Boys have appeared alongside other hate groups at extremist gatherings like the 'Unite the Right' rally in Charlottesville." The SPLC, McInnes stated, has "gone from defending people to destroying people."